Sell to Us Price: $14.54 each. One ounce silver rounds are among the most economical ways to buy silver bullion. Buy these silver bullion rounds and save even more. We get assortments of 1 troy oz .999 fine silver rounds and reduce the premium for customers who do not have a preference in terms of a specific design for silver rounds. The one ounce silver rounds we offer are fully tested and 100% guaranteed for weight and purity (.999 fine silver). Buy these silver rounds with confidence! 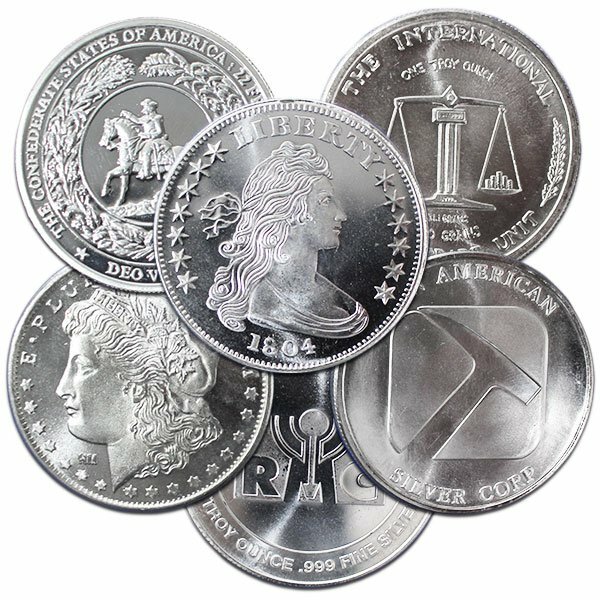 If you're looking for specific silver bullion coin designs, you can look into Buffalo Silver rounds or Walking Liberty silver half dollar rounds here. Both of these silver rounds come in 1 troy ounce, however you can get the Walking Liberty silver rounds (fractional silver bullion) in smaller sizes. Our current buy pricing is $14.54 each and we will buy up to 2,000 ounces at this price. Simply call us on any weekday to lock pricing at 1-800-800-1865. I'm sorry but I can only give you 5 stars. I would had given you more but I don't have that option. I just sold my van that I was trying to sell for three years. I got $3000 for it. Every day I would look at it and I would think " here is something of value but it's depreciating every day and not working for me." As soon as I got payment for this van I got into my electric wheelchair and went to Walmart and got a money order. Total sale was just under $3000. The next day I saw Mmx advertisement with their special. Buy $3000 and get free shipping and a free 1 oz silver bullet. I contacted MMX by chat and I was able to change my order by buying two more 1oz silver rounds. Wow, what a great dealer. I recently purchased some of the Silver Round(s) - Random Design, and am thoroughly please with them. They arrived as scheduled, and were all very nice, with no damage or tarnishing. I will buy more of these as my budget allows, and the availability is there. I have been buying (and sometimes selling) silver in various forms since the 1970s and have done business with several different companies. Since I was introduced to MMX several years ago, I have only purchased silver from them. I pay by personal check. There have never been delays and delivery has always been on time or in advance of the projected date. There has never been a "miscount" and the rounds arrive in "mint condition" (my description) and in convenient containers. My wife and I were surprised by the black metal box with silver MMX logo which contained our last shipment. The box will simplify inventory accounting. Thanks for the great service and products, MMX! P.S. The free shipping and bonus 1 oz. silver bullet were very nice too! The Random Rounds Silver Coins were a good bargain, and are all very nice looking coins. They arrived quickly and well packaged. An overall excellent experience. The random rounds are not only a good purchase because of the price, but the quality of the product was also excellent. Something I plan to do again and again. You can now sell your Silver Round - Random Design - 1 Oz .999 fine silver back to us online, at a price of $14.54 each!